The pan-India office vacancy in 2016, at 15%, was the lowest in eight years. On the back of positive office space demand from sectors like manufacturing, logistics, FMCG, consulting firms, etc., the year saw a record low vacancy largely driven by IT cities such as Bengaluru, Pune and Hyderabad – each of which saw vacancy in single digits. 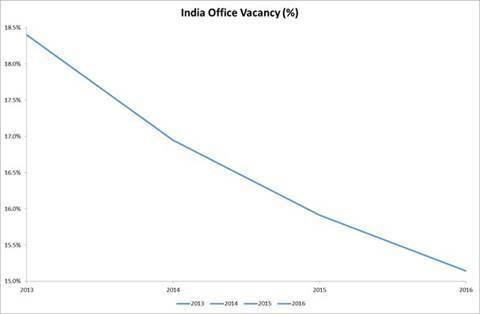 The sharpest reduction in pan-India office vacancy was seen between 2013 and 2016 when it went from 18.5% to 15%. Vacancy in Bengaluru has reduced from 14.5% in 2010 to 3.8% in 2016. Chennai’s vacancy has come down from 32% in 2010 to 11% today. Hyderabad has also seen its vacancy reduce from 15.5% in 2009 to 9% in 2016. Similarly, in Pune, vacancy has reduced from 17% in 2009 to 5.5% today. The pan-India vacancy is forecasted to increase marginally this year and remain range bound until the year 2019. Even as India’s office real estate is set to be the biggest gainer among asset classes – thanks to steady demand, rising GDP and launching of REITs in the next one or two quarters – availability of right space at right location remains a challenge for many occupiers looking for grade-A offices, especially the ones looking for superior grade-A office space. The latter have been facing a challenge in recent times due to the ongoing space crunch. As vacancy reduces across key cities, the supply of good quality assets continues to diminish. Vacancy in higher quality assets is far lower than the average city-level vacancies. Assets poorer in quality or at inferior locations or strata-sold (in Delhi-NCR and Mumbai), have a much higher vacancy, except in the IT cities like Bangalore, Pune, Hyderabad and Chennai. The net absorption in 2018 is forecast to be lower than this year due to scarce supply, and this is likely to be acute in Chennai and Pune. Thanks to more investment in infrastructure, cities such as Pune, Hyderabad and Chennai are expected to drive office demand in 2017. As a result, rents, will grow in even in Grade-B buildings too and certain micro-markets. The pace of growth in rents will not be the same across cities and micro-markets as they may have run their course already. Due to RERA, REITs and demonetisation, more and more office assets are expected to start getting institutionalized and demand for strata-sales is set to decline, especially in Delhi-NCR and Mumbai. While some developers with a portfolio mix of commercial and residential developments are focusing more on building commercial assets, a select few have reportedly moved their focus entirely towards the commercial asset class. 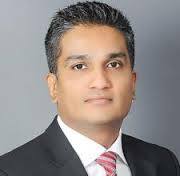 Certain other players in the real estate sector have been aggressively building up their commercial portfolios in the country in anticipation of REITs. India’s growing stock of grade-A commercial assets presents great opportunities for REITs.